Everyone’s favourite Viking is coming back to the big screen: SKAGGERAK, the movie about Casper Steinfath’s epic crossing from Denmark to Norway, will premiere in early May. “Skaggerak” is the strait that separates Denmark and Norway. It’s over 100km wide and steeped in Viking history. Casper first attempted the crossing in 2017 but fell just a few agonising kilometres short — forced to abandon his mission when land was within sight. 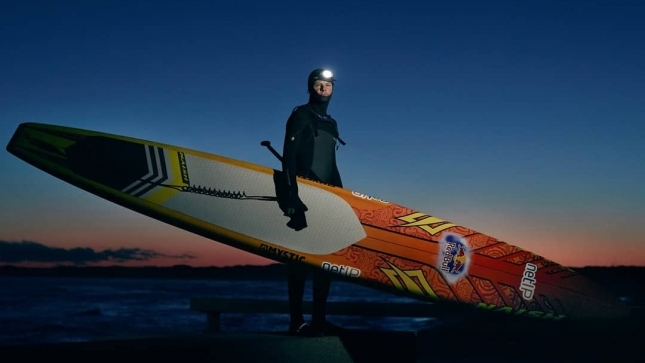 He saddled up again 12 months later for a successful mission of redemption, completing about 135km (74 miles) of open ocean, mid-winter paddling in 19 hours to join the likes of Chris Bertish and Bart de Zwart in an exclusive club of crazy inspiring, ultra-endurance adventure paddlers. Now, following a successful Kickstarter campaign, the story has been made into a full-length movie — SKAGGERAK will premiere on May 3rd @ the Cold Hawaii Surf & Film Festival in Casper’s home nation of Denmark (get tickets here). It’ll be followed up with a screening in Copenhagen on May 7th. This is the second full-length film Casper and his crew have released, following on from “Standing On Water” in 2016. Check out the trailer below and follow Casper on Insta for more.